Schoolcraft played high school baseball at Randolph HS. He has been coaching youth and high school baseball since he was 18 years old and has been the Nashoba Regional High School Varsity Baseball Coach since 2002. 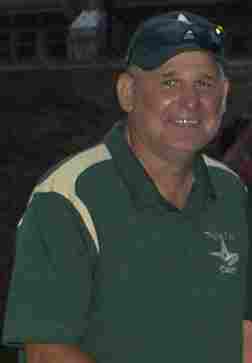 In his 16 years at the helm of Nashoba Reg HS he has accumulated over 200 wins. He has sent over 60 kids to the college ranks to play baseball, all divisions. In 2013 he led Nashoba to their first Central Mass Division I title and first appearance in the Division I state final. In 2017 his team reached the Div 1 District Final. At one point his teams captured the Mid Wach League Title three years in a row, 2013, 2014 and 2015. His teams have averaged 16 wins a season since 2012. He was the Assistant Varsity Baseball and Pitching Coach for Hudson High School from 1995- 2001, and was integral in the development of the team that won the 1999 Div 2 State Championship. He was a Senior Babe Ruth Head Coach (1996 - 2004), a Clinton Legion Coach (2005). He has been an AAU Coach for 20 years. He has lead his teams to the AAU New England Finals, Semi Finals and to Nationals at the 15U and 14U levels. Schoolcraft led the 2007 15U Super America’s Pastime Team to the New England Championship. In 2010 and 2012 his 14U Triple Play All-Star AAU teams won the New England Open Championships. In 2016 his 14U Triple Play All-Star team won the AAU New England Super Championship. He took the 2011 14U Triple Play All Star Team to the New England Open Semi Finals and the 2014 14U Super Triple Play All Star Team to the New England Semi Finals. Schoolcraft has been a pitching instructor since 1997. Over 200 of his pitching lesson students have gone on to pitch college baseball, several at Division 1. Coach Schoolcraft currently offers pitching and hitting lessons on an individual or group basis. He is also the Director of Nashoba Baseball Camp for the last 15 years and has developed a successful Triple Play fall ball program with over 30 teams every year at all age groups. Contact Coach Schoolcraft for Pitching/Hitting/Fielding lessons by calling 508-561-4268 or via email. pick Mike Bryant (father of NL 2015 Rookie of the year, NL 2016 MVP, and 2016 World Series Champion 3B Kris Bryant of the Chicago Cubs). Mark won the 1982 NE DIV. II batting title (.444). Chiasson, graduated from Hudson High School (Hawks) in 1978, was a 3 sport athlete (football, hockey, baseball) and was twice inducted into the Hudson High School Hall of Fame individually and also as a member of the 1978 Div. 1 State Hockey championship team. Mark has coached hockey and baseball since 1993 and was the 12U AAU coach at America's Pastime (2006-2008) and Triple Play All-Star AAU (2010-present), leading his team to the State Semifinals at the U12 level in 2007 and most recently the 2012 12U Triple Play All-Star AAU team to New England Open Championship finals. 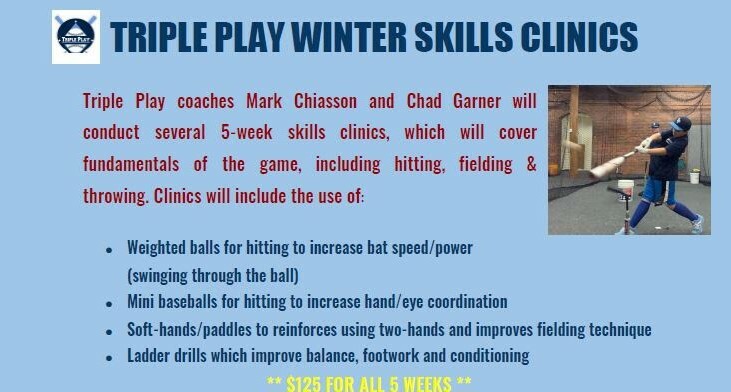 Chiasson has been a hitting/fielding instructor for 15+ years. Many of his current lessons include local high school players, and many have continued on to play college baseball. He currently offers individual or group lessons/clinics for ages 6 and above, and is co-owner of Triple Play. Contact Coach Chiasson for Hitting/Fielding lessons by calling 978-407-1818 or via . 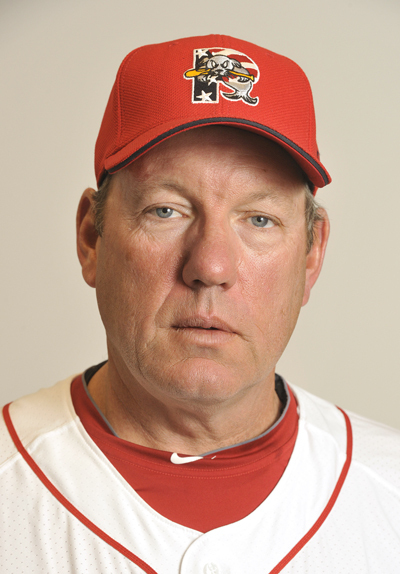 Gedman, a Worcester native, is former former Major League Baseball catcher who played 13 season with the Boston Red Sox (1980-90), Houston Astros (1990-91) and St. Louis Cardinals (1991-92). Coach Gedman was the Sporting News' AL Rookie of the Year (1981), a two time All-Star (1985-86). In his career, Coach Gedman batted .252 with 88 home runs, 382 RBI, 331 runs, 176 doubles, 12 triples, and three stolen bases in 1033 games. As a catcher, he compiled a .984 fielding percentage with 5274 putouts, 431 assists and 92 errors in 980 games. In addition, Gedman skippered Can-Am League Worcester Tornadoes from inception in 2005 to 2010, including leading the team to the 2005 Can-Am League Championship in its first year of existence. For his efforts, Gedman was named 2005 Can-Am League Manager of the Year. Gedman is the current hitting coach for Boston Red Sox Double A affiliate Portland Sea Dogs. Coach Gedman does Catching Clinics November thru February. University of Maine 2013-2016 Student Athlete Baseball. Graduated University of Maine with a Bachelors Degree In Kinesiology and Exercise Science. 2013: Saw action in 10 games on the mound his rookie season... posted a 2.79 ERA... struck out nine batters... appeared in six straight games to begin his freshman campaign without allowing an earned run… named a Maine Scholar-Athlete *Rising Star*. 2014: Appeared in 21 games for the Black Bears, with 20 of them coming out of the bullpen... with a 2.54 ERA... earned a victory in relief against Northeastern (3/4)... led the Black Bears in saves with five... struck out three batters in his season debut at #13 Miami (2/14). 2015: Led the team with 23 appearances, all coming out of the bullpen... finished 3-5 with a 4.80 earned run average... tied for the team-lead in saves with four... struck out 38 batters in 45 innings pitched. 2016: 16 appearances out of the bullpen. 22.1 innings pitched with 15 strikeouts. And threw 2 scoreless 7th and 8th inning relief in a Win over Clemson University. Graduated Nashoba Regional High School in 2012. Four year varsity baseball player, Sophmore Year, first team league allstar, Junior Year Leauge CO-MVP Mid wach B central mass, Senior Year MVP of Mid wach B and Allstate first team and Super-Team. served as a captain his senior season where he finished with a record of 6-2... had a 0.91 ERA with 90 strikeouts... he pitched one no-hitter and five one-hit games... his final two season, he hit .382 with 47 RBI, a .483 on-base percentage and 10 home runs. Recruited to Maine as a two-way player for pitching and first base. After freshman year decided to focus on pitching. Schoolcraft Jr. played baseball for Hudson HS (1995 – 1998) and recorded 221 career strikeouts. He played for Nichols College (1999 – 2002), and has been a pitching Instructor at America's Pastime 2003 - 2007, Triple Play Batting Cages 2008 - present. AAU Coach America's Pastime 2004 - 2007, Triple Play All-Star AAU 13U Head Coach 2010-2011 & 2013-present, Triple Play All-Star AAU 14U Assistant Coach 2012. Schoolcraft lead the 2011 U13 Triple Play All-Star AAU team to a 10-2 division record and qualified for the New England Open Championships. Fall Ball Little League Coach America's Pastime 2005 - 2008. Coach Scott is a Waltham native who played baseball, football, and basketball for the Waltham Hawks from 1982 to 1986 where he led the Hawks to four Superbowl’s as their running back and linebacker at Waltham High School. He also played 4 years of baseball for the Hawks and in 1985 played in the Connie Mack World Series in New Mexico. After earning a football scholarship to Northeastern, Scott played for one year where unfortunately he suffered from a career ending injury. Scott then served as Assistant Varsity Football Coach at Waltham High School for 5 years, and then served as Assistant Varsity Football Coach at Watertown High School for 8 years. Scott was proudly inducted into the Waltham High School Hall of Fame for football in 1996. 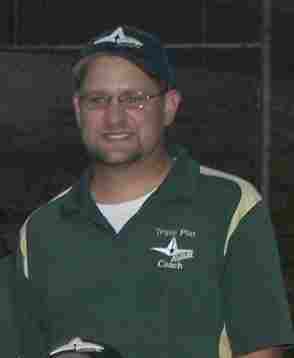 Scott started coaching at the Little League level in 2004. Scott managed the 12U Hudson Hawks All-star team, where his Hudson Junior Hawks won the 12U State Championship. Scott also coached the 9U-14U AAU baseball teams for the Worcester Warriors as well as the 13U and 14 U Triple Play Batting Cages teams. Scott resides in Hudson with his wife Julie, where he has lived since 1999. They have 2 boys, Scott and Justin who are active in Baseball and Football at Assabet Valley Technical High School. Scott’s coaching philosophy is simple yet very effective. He looks for each of his players to work hard, be dedicated, focused, show leadership, teamwork, and mental toughness in all they do. He always looks forward to having fun with his teams and his main objective is to develop his players and get them ready to play at the next level. 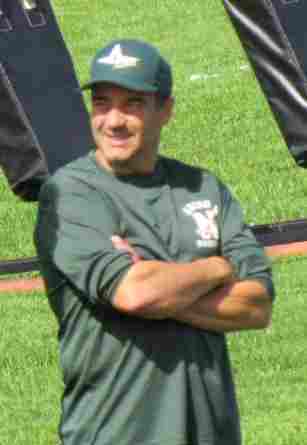 Jim Rivela has been coaching for over 20 years. During this time he has coached every age level from T-Ball thru Babe Ruth. Jim was involved in Hudson Youth Baseball (HYBS) for many years where he was League Coach, Tournament Director, All-Star Coach, Webmaster, Secretary, and President. During this time at HYBS Jim coached tournament teams which had won two District titles and one State championship. Jim has also ran many tournaments including local tournament known as HIT (Hudson Invitational Tournament), State and Regional tournaments as well. Jim has also been involved in travel baseball for 10 years for both AAU and NEEBL league. His AAU teams have been #1 in their division 5 times. His 13U team went to the AAU New England Regionals and placed 2nd. Later on his 15U team won the AAU New England Regionals. He ran his own AAU teams called the MetroWest Mustangs for several years. He has also coached for NE Wolfpac and Evolution Baseball. Jim was with the former Worcester Warriors where he was the director and a coach. Jim has taken 10 teams to Cooperstown to play tournaments at Dreams Park, All-Star Village, and Abner Doubleday. Jim has been a High School Coach for last 4 years coaching at St. Peter Marion and Nashoba High and has been coaching with East Side Legion Post 201 for 3 years. Jim is also a Mass Baseball Umpire (MBUA) for 8 years umpiring High School levels from middle school thru Varsity. He also umpires for AAU leagues and up at Cooperstown Dreams Park. Bowen is a lifelong resident of Hudson, MA and has been involved with youth sports and programs for the past 18 years. He is currently the W Mass State Secretary of Cal Ripken Baseball (Division of Babe Ruth Baseball) and District 3 Commissioner. Brian also served as President of Hudson Youth Baseball for 7 years in addition to various Board, Director and coaching positions. His association with AAU Baseball dates back to 2004. Brian is also a member of many area youth Boards including Chaps (Children's After School Programs) and previously the Metro-West Boys and Girls Club. In addition, he has been the Assessor for the Town of Hudson for the past 10 years.